Paperwhite narcissus bulbs may be one of the easiest bulbs to force for indoor growing because they do not require a chilling period before they will grow. If you purchase the bulbs before you are ready to force them to bloom, simply hold them until approximately one month before you wish for them to bloom. Store paperwhite bulbs for future forcing, and when you are ready, they will be ready to emerge with tall stems and creamy, white blossoms. Examine the paperwhite bulbs before you store them to ensure they do not have any areas of decay. If you find decaying bulbs, discard these. Storing a decaying bulb with other healthy bulbs can damage the entire bunch of bulbs. Place the paperwhite bulbs into the paper bag. Roll the top of the down to enclose the paperwhite bulbs securely within the bag. Store the paper bag in a moderately cool and dry location. A standard interior room with temperatures between 60 F and 75 Fahrenheit is ideal for paperwhite storage. Store the paperwhite bulbs for three to four months in the bag. Remove the bulbs from the bag when you are ready to plant them. 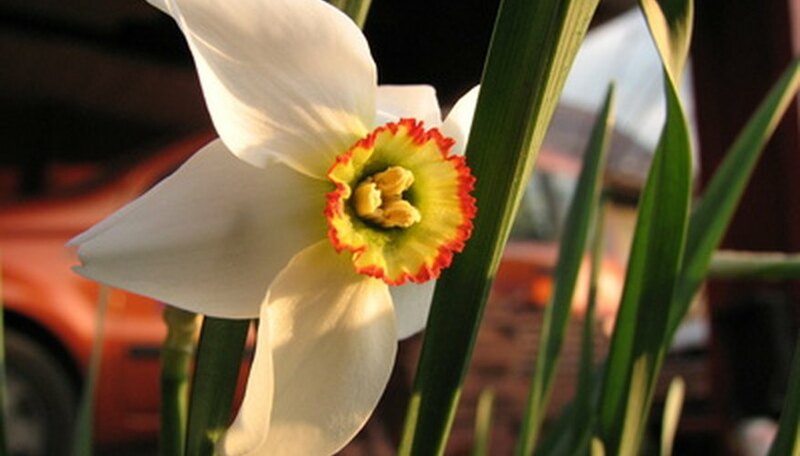 If you find any bulbs with green shoots, plant these bulbs as soon as possible. If you find any bulbs with decay, discard these bulbs.